SRM Entrance Exam results are considered for admissions to its engineering courses with various specializations. The Online Entrance Exam was conducted from 17th April 2014 and 22nd April 2014 in two sessions per day. The Offline Examination was held on 27th April 2014. 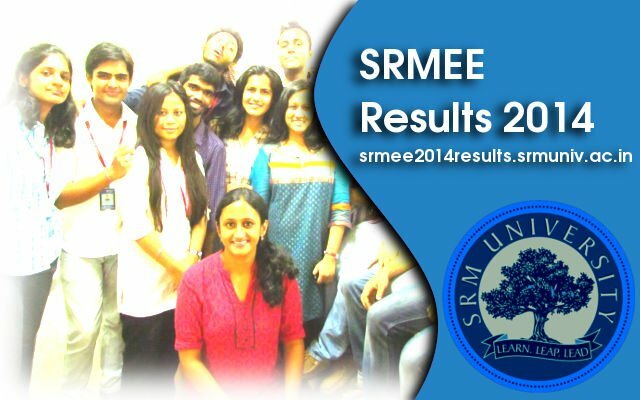 The results are available online and can be checked on SRM University Result Website. The SRMEEE 2014 Applicaiton Number or Hallticket Registration Number is required to check the Results of Entrance Exam. Candidates who appeared for the examination can send SMS to 9282111247. Candidates compose a message as SRMEE<space>application number or hall ticket number and send to 9282111247. Candidates will get the result in replay SMS. The candidates who successfully pass the SRMEEE 2014 exam will be asked to come in for an interview. It will be a counseling interview for the students so that they can decide for themselves and make a decision about courses and its features. They will be allotted seats in the University. The date for the counseling session is from 17th of May, 2014 to 24th of May, 2014. SRM University conducts the Engineering Entrance Examination to allot admission to various engineering courses. For Bachelor of Technology (B Tech) and Health Sciences (Undergraduate), candidates can choose to take the examinations either on offline or online mode. For Masters of Technology (M Tech), Master of Business Administration (MBA) and Master of Computer Applications (MCA), all candidates need to appear for the online entrance test.